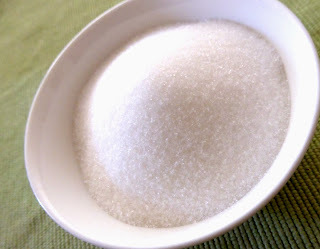 Jejune's Place: How much sugar is REALLY in that? How much sugar is REALLY in that? Today I read this article on the Huffington Post, We live in a world where salads have more sugar than donuts. Having lived in the States myself, I can certainly attest that American food is in general very sweet, compared to Australian. The bread tastes like cake. The desiccated coconut has added sugar. And so on. However, the list presented in this article isn't all that helpful, as the serving sizes haven't been standardised. While there is some value in seeing how much sugar is in 'one serve', it's quite common for a smallish bottle of juice, for instance, which you'd drink in one sitting, to be classified as containing two serves. And 'one serve' of Fruit Loops is only 30g. Do you know how teensy an amount of cereal that is? So you really have to standardise the amounts to be able to see relative amounts of sugar. And here's my list, also ranked from least to most sugar. These are quantities of sugar per 100 ml or 100 g of the food, depending on whether it's a drinky thing or a nomming thing. † Ooops, the original article had a big mistake here ... there are 33 calories in a bottle of Vitamin Water, not 33 grams of sugar! * Not the original salad mentioned in the HuffPo article, but a Thai chicken salad from a restaurant chain that actually gave a weight for the serving size. So possibly not a good comparison. but proof that a Thai chicken salad doesn't necessarily have a high sugar content! ** I couldn't find the exact same Thai Chicken Salad on the California Pizza Kitchen menu, but this was probably the closest match. The menu only lists 'Half' or 'Full' for size, not a weight, so I have no way of knowing how heavy the salad is. I've use the size of the Au Bon Pain salad as the size of the CPK one, but this is probably wrong. So really, without a weight of the actual CPK salad, we have to completely eliminate the salad from this table. *** I also couldn't find a weight of a Sprinkles cupcake, but have used the serving size weight for a cupcake from the nutrition info on their Red Velvet Cupcake Mix. **** The Signature Truffles box, shown in the original article, didn't have nutritional information on their website, so I've used the Individually Wrapped Chocolate Truffles instead. So, the take home message? Don't start replacing your salads with doughnuts (or donuts even), cupcakes, chocolate truffles, or Fruit Loops as 'lower sugar' alternatives. They're not. Thanks for sharing, Denise. Andrew and I were appalled when we purchased a container of 'natural' peanut butter from a Whole Foods store in the USA, only to find it was so sweet as to be inedible. Gross. I'm very grateful to be able to cook. Means we don't have to eat sugar-laced rubbish. I am a child of the sugary drinks culture and will admit an unnatural fondness for soda. BUT I do read the labels and make those bottles last for 2 or 3 servings and I only allow myself to have them on special occasions. I have a whole mouth full of sweet tooths and they are very demanding. I am always aware of how much sugar is in food and drink, but I am not giving up sugar. I only have it in my tea when I am out, and I try to buy little processed food. I am also trying to make my own sauces etc. The serving sizes are really, really deceptive, I think it is something like 6 BBQ shapes!!! And to point out that serving size does matter, and it's really comparing apples to ducks if you don't use a standard amount when making these sorts of comparisons and value judgements.